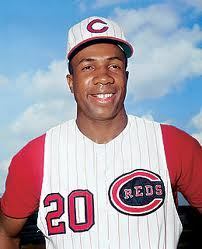 Born on the 31st of August 1935, Frank Robinson was one of the greatest outfielders to play baseball. His career lasted for twenty one years and he is best remembered for his contributions to Baltimore Orioles and Cincinnati Reds. Robinson remains the sole player to bag MVP awards in the American as well as the National League. He finished as a World Series winner on two occasions, both with Baltimore Orioles. At the time of his retirement, he was fourth on the all-time home run scorers list, leading to his election to the sport’s Hall of Fame. In his early playing days, Robinson was subject to racial prejudice to a great extent. He wasn’t allowed to visit the hotels as his team could. He was the only African American player on his team, which made it extremely hard for him to go about his trade. However, his class on the ballpark silenced the jeers many times and Robinson went on to have a career that only few players could have even dreamt of. The early days of Robinson’s playing career saw him establish a reputation for creating problems for those who suddenly fell prey to his inexplicable mood swings. A ‘dirty player’, as he came to be known, Robinson would show immense fire and desire, so much so that he would use unconventional methods to spike the infielders of the opposing team. His playing style was fierce, and he defended his on-field antics by saying that he just couldn’t relax on the field and that he went all out in every game. He often slid hard when he stopped at a base, not caring for the shortstop who stood in the way. Several opponents have been spiked by Robinson, but the man himself claims that it was completely out of his passion for the game and not out of intent. Robinson is the first ever African-American manager in MLB history. The fact that the odds would be against him were clear to Robinson, but becoming a manager was his dream since his playing days. Although players were now integrated and racial problems had reduced significantly since the start of his playing career, there was still the color barrier in the managerial sector. No Hispanic or Black man had ever become the manager of a team from the big league, making it very difficult for Frank to obtain a managerial position. However, his expertise and success in the Puerto Rican league finally landed him the job in MLB. During his long and successful career, Robinson recorded a batting average of .294 and scored 586 homers. He also recorded 2943 hits and an RBI of 1812. When he retired, he was behind only Willie Mays, Babe Ruth, and Hank Aaron in the all-time home run scorers list. With 324 home runs for the Reds, he is their second highest scorer. His slugging percentage of .554 is the highest for the Cincinnati club. His jersey number 20 is retired by both the Reds as well as the Orioles. Robinson was part of the All Star Team on 14 occasions, and had won the Gold Glove, National League MVP, American League MVP, Triple Crown, World Series MVP, All-Star MVP, and Babe Ruth Award once each.